Local hospitals, churches, businesses and tradesmen have all played a part in this beautiful facility coming together. “The facility was basically made over by contractors that volunteered their time. Paint stores that gave us paint. Pretty much what you see here, 98% of it was donated,” Meyer said. Volunteers gave of themselves and their time, without expecting anything in return, to care for those who are truly in need. 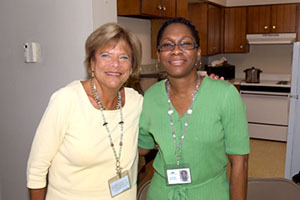 Meyer and her staff of volunteers see many sad cases nearly every evening. “It breaks your heart. Every night there’s a case that just kind of humbles you. On the other hand, it gives you hope that this care center will provide care that will hopefully change some lives and get them on the right track,” Meyer said. “A lot of the people who come in haven’t been to a physician in 3 or 4 years, and some of them come in with an income of zero dollars,” Meyer said of the heartbreaking facts. “There is a young woman who was basically malnourished, partly because she doesn’t have the money to eat, but partly because she’s so depressed,” Meyer explained. They were able to help this young woman and lead her in the right direction. “Another lady came in with shoulder pain and also had a lot of other medical problems. She had no resources to go get it looked at and came in with a frozen shoulder, because she’s been holding it in her arm for 3 years because she hasn’t had care,” Meyer said. “That’s someone who needed to be taken of 3 years ago when the initial injury happened,” she continued. Meyer told another story of a diabetic with a foot infection. “He thought soaking his foot in warm water would help, but he couldn’t feel his foot and burned it so badly that they had to send him to the hospital,” she said. “People ask ‘Why do you do this?’ and it gives us the opportunity to share the real reason - that we feel God calls us to look after people that are hurting,” Meyer said. “If you look where Jesus walked, wherever he went, he healed the sick. He called the disciples and the first thing he did is went to these communities and healed people. It’s kind of the model. If you meet a physical need you’re given the opportunity sometimes to share a spiritual need fix as well,” Meyer said. “This came out of a dream about 30 years ago,” Meyer said. While in medical school, Meyer and her husband were inspired by the story of one man who left his lucrative career to start community Christian health care centers in Mississippi. “Everyone criticizes the government for healthcare and taking care of the poor and orphans, but he said it wasn’t the intention of God for those people to be doing it. It was supposed to be the church,” Meyer said of the ‘aha moment’. “His whole push was to unite the church back to a job that it was supposed to be doing, and that made a lot of sense,” Meyer said. “Typically a body of people that weren’t intended to do something really doesn’t do it as well as the body that was supposed to be doing it. So he kind of challenged everybody that weekend someday down the road to figure out what that means in your case and what you’re doing in your faith system,” she continued. Meyer and her husband also spent a lot of time outside of the country, caring for the hurting in third world countries. “But you see it in your own backyard and go ‘Geeze, somebody else needs help other than that’. It’s a big need,” she said. The mission is currently building up their pharmacy with supplies and volunteers. They have about 17 pharmacists but need 30 to be open every night. “We ask people to give up one evening a month; if you burn out, you don’t stay with ministry,” Meyer said. “Our hope is that if we can show that this works, that we can come together and do this well, then gather a few more churches, maybe in a different area of town and say ‘Would you be a spearhead group to help get another center started?’” Meyer explained. They also work closely with others. After each patient’s initial visit, those with chronic medical problems are referred to other local offices for continued care, including Access to Care, OPEN M, Town Hall II and other clinics. The volunteers have nothing but good to say about their time at the clinic. “This is by far the best volunteer experience I’ve ever had. It runs amazingly smoothly. The hours are very nice for a physician who has a family like me,” Paul Laconte, Internal Medicine and Pediatrics Doctor and volunteer, said. Deb Henderson, RN at the Akron Children’s Hospital, and volunteer, agrees. “I’ve wanted to give back for a long time now, so when I found out the clinic was going to be opening I figured it was perfect for me,” Henderson said. Though she volunteers once a month, she says she would like to do it more. “Everyone is so friendly. All of the people that come in are just so grateful the clinic is there. The people are so nice. It’s been an awesome experience. I love it,” she shared. As for health care in this country, where it’s headed and what the demand for a clinic like this will be in the future, they don’t know – but they are determined to keep running as long as there is a need. “There’s hope. It’s a big problem. I’m not sure it’s fixable as quickly as Washington says. I think they’re not as naïve as they were, but it’s a big problem that’s not going away anytime soon. If they fix it, great. But I have a feeling that we’re gonna be around here a long time, to be honest with you,” Meyer said. To find out more about this clinic make sure to visit their website: www.faithfulservantscarecenter.org . And don’t miss Part Three of the story .